PROVIDENCE, R.I. (AP) — Rhode Island’s Democratic governor cruised to victory Wednesday following a bitter primary, while her 2014 Republican opponent won the right to a rematch. Raimondo fended off a challenge from the left by former Secretary of State Matt Brown. Despite speculation stoked by Brown and others that the race might be close amid a lack of polling, Raimondo beat Brown handily. Raimondo, 47, has been running on her record of job creation and an improving economy, as well as her work to repair crumbling schools and roads and a free college tuition program she started. 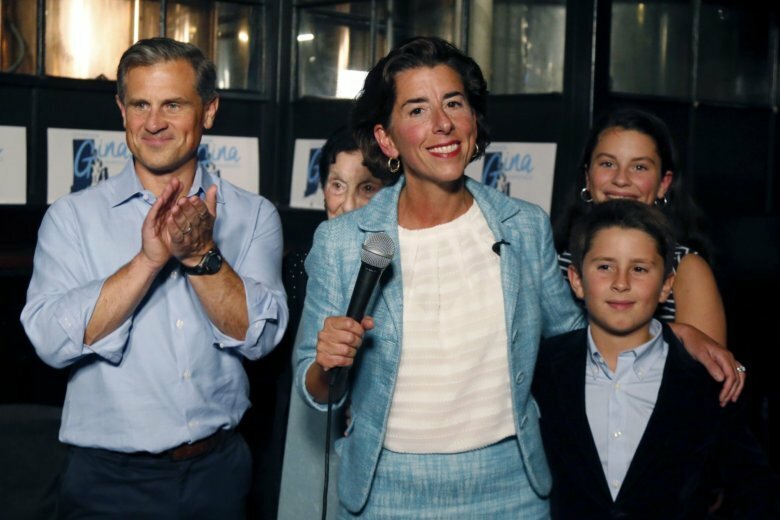 “Tonight the people of Rhode Island have said do more, go faster, and keep going,” Raimondo told supporters at a victory party. She has been hammering the message that she is leading the state on an economic comeback after years of lagging behind its New England neighbors and the rest of the country. But the former venture capitalist has also struggled to build her popularity since she was first elected in 2014 in a three-way race with just 41 percent of the vote, over Fung’s 36 percent. Many members of public employee unions are still angry about her work as general treasurer, when she spearheaded an overhaul of the state’s pension system, which resulted in cuts to benefits. She then invested hundreds of millions of dollars of pension money in hedge funds, saying that would reduce risk but which her successor backed away from because of huge fees. Fung beat Patricia Morgan, a state lawmaker. “We can do better than Raimondo’s Rhode Island,” he told supporters Wednesday night. Fung, a Trump supporter, has given few interviews , held no press conferences and said little about his views during the race. He agreed to a single debate on a small radio station. He says he wants to cut the sales tax from 7 percent to 5 percent, but he hasn’t put forward a detailed plan to pay for it. In one of the few interviews he gave during the primary season, with The Providence Journal this month, Fung, 48, said he is no longer for abortion rights, a change from 2014. He also said he would not support an assault weapons ban. Fung’s parents immigrated to Rhode Island from Hong Kong in 1969. They opened a Chinese restaurant in Cranston, where Fung bused tables and washed dishes throughout his youth. He went on to become a lawyer, working at the attorney general’s office, then MetLife before being elected Rhode Island’s first Asian-American mayor in 2008. If Fung wins in November, he would become the state’s first Asian-American governor. During the 2014 campaign, Fung disclosed that he had killed a man in a car crash in 1989 when he was a college freshman. He was never charged and had his record expunged. The victim’s family said it forgave him, and his opponents did not make it an issue. Raimondo and Fung will face a three-way contest in November, against independent Joe Trillo , a former Republican state lawmaker who headed then-candidate Trump’s state campaign in 2016.